It seems like every day we're getting a little bit closer to having tricorders, and today's no exception. Researchers at the University of Illinois at Urbana-Champaign have designed hardware and software that turns the iPhone into a powerful biosensor that's useful for toxin and pathogen testing as well as medical diagnosis. The package consists of a cradle that contains an assortment of lenses and filters which line up with the handset's camera, along with an app that guides the user through the testing process. 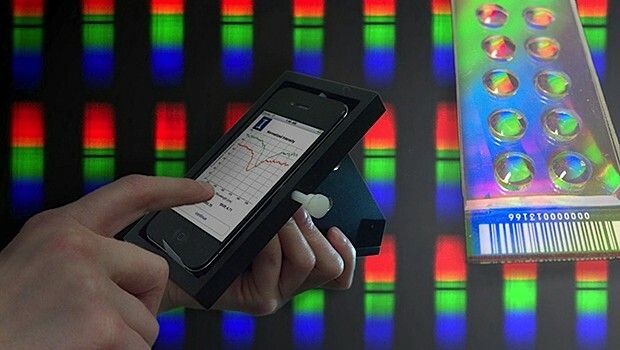 At the core of the device is a photonic crystal slide which basically turns the iPhone into a high-resolution spectrometer. While the cradle only contains about $200 worth of parts, it's just as accurate as laboratory equipment costing tens of thousands of dollars, with the added bonus of being hand-held. The team just received an NFS grant to explore other applications for the device and is working on a cradle for Android phones. Hit the break for a demo video and a peek into the future.